The metal is extremely versatile and is used in a multitude of different products, ranging from cars to window frames, and from aeroplanes to food packaging. This endless reuse cycle is also known as ‘closed loop’ recycling. For drink cans collected in the Ireland the closed loop means used cans are reprocessed and remade into more drink cans. Drink cans and bottle tops are typically collected from homes,mixed with other food and drink packaging, including steel food tins. The recyclable materials will be taken to a materials recovery facility (MRF) where they are sorted. Metals are separated using magnets, and the aluminium and steel items are compressed into bales. 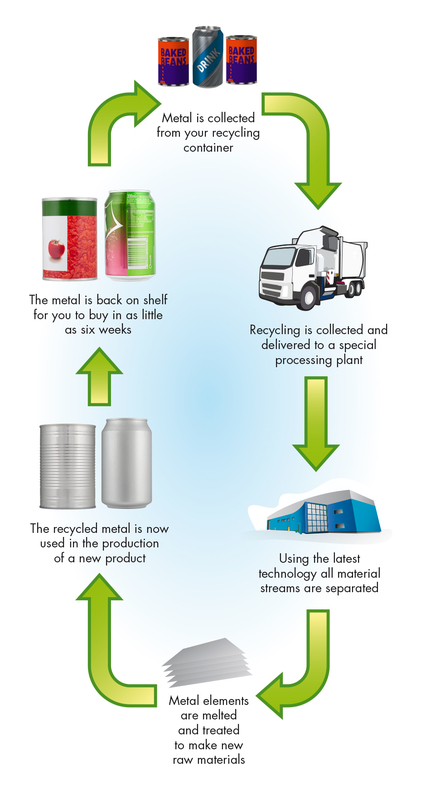 Bales of aluminium packaging are then taken to a reprocessing plant, where they go through four stages – shredding, decoating, melting, and casting. During the final stage, the molten metal is cast into large ingots.